Nic Stuart: FIGHT! FIGHT! FIGHT! 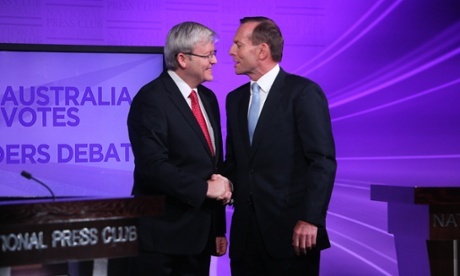 The first debate of the election campaign . . . hopefully the last. I'm all in favour of genuine opportunities to hear and question the 'leaders', but this was ridiculous. There was really no doubt in my mind, as this article for Tuesday's Canberra Times makes clear . . . There can be absolutely not doubt about who won the leaders debate. Sky News’ David Speers spoke definitively and emerged with his credibility intact. A succession of tightly framed questions was spot on. Unfortunately, neither panellist matched either his precision or insight. They debated the same old issues in the same old way. Waffle reigned supreme. Julia Gillard (does anyone remember her?) once told journalists not to “write crap”. As an instruction this raises difficulties. Are we meant to report what politicians say or not? Take tax. Both sides promise not to raise taxes, yet this hasn’t prevented either from promising a bounteous cornucopia of future wonders. They promise to increase government services and yet still leave more money in your pocket! How can this be? How can we not write rubbish when it’s all the politicians’ offer? Tony Abbott’s relying, essentially, on the miracle of the loaves and the fishes. This is a lovely story. Hundreds of people followed Jesus to hear him preach – how sadly different this is from our attitude to politicians today! Jesus’ campaign managers (let’s call them “apostles”) then faced a seemingly insolvable problem: how to feed the multitude with just a few loaves and a couple of fishes. Yet this was the miracle. No matter how often the food was divided, there was always more for someone else. Now don’t get me wrong. Tony Abbott isn’t pretending to be Jesus – he hasn’t grown a beard and nor has he (yet) adopted long, flowing gowns to cover his Speedo’s. But he’s relying on exactly the same sort of economic miracle. The Coalition insists the less companies are taxed, the more money will remain to float magically into your pocket. Wealthy, productive people will spend. It will trickle down and stimulate the economy and eventually, presumably, even into the pockets of otherwise useless people like journalists. This is typical, old-style expansive reasoning. Unfortunately the economy has changed. The Coalition is doing exactly the right thing by promising a general review of taxation but exactly the wrong thing by promising to tax business less in the meantime. It’s ignoring the original meaning of the scripture story. The miracle worked by diving up the goodies amongst the masses; not by handing everything to one person and hoping – fingers crossed – there’ll be enough crumbs left over to feed everyone else. Take journalism, for example. Newspapers aren’t struggling because they’re being taxed. Their problem resides at a much deeper level, within the very business model itself. More money for Fairfax won’t be used to employ more journalists. It’s the same as the car industry. Propping it up with assistance will just distort the economy further. These are fundamental problems. The way both parties are attempting to deal with these issues is by papering over the deep fissures and suggesting everything is OK. This will simply encourage the development of a myriad of personal service companies as people seek to evade tax. Workers performing the same tasks will be penalised simply because of the way their business model is structured. It’s a win for the bureaucrats and accountants and a loose for the economy overall. So does this mean Kevin Rudd’s got it right? Hardly. During the debate he pointed to “record low interest rates” and good unemployment statistics before pausing to frown slightly. Perhaps his supposedly razor-sharp intellect was, finally, struggling to reconcile how it could be that in such a dynamic economy, that his own political fortunes could have reached such a nadir. Did people not realise that the messiah was back? Ironically, it’s Rudd who has been far less reticent than Abbott about wearing his Christianity on his sleeve; well, whenever it’s suited his political purposes anyway. Perhaps its best not to ask Rudd about whether, for example, it’s his moral duty to offer asylum for the persecuted any more. But why don’t the masses still want him to divide the loaves and fishes? The answer is simple. Inequality has become ever more firmly entrenched under this government. Why should money that’s been made from buying and selling investment properties be taxed at half the rate of money that’s been earned by actually working? Why should those who can afford to convert salary into superannuation receive benefits for investing when they’d be doing it anyway? Labor’s economic reform record is atrocious. In his first term in office Rudd made a shambles of implementing the fine recommendations of Ken Henry’s tax review. There’s not even the glimmer of a prospect that he would do any better next time round. The polls suggest that many people remember life with Rudd is akin to a bad marriage. Noble words. The ever-present promise of reform. And then the battering begins again. Just ask Gillard. The debate simply demonstrated the artificial political environment the politicians are swimming in at the moment. The arguments swirl like a whirlpool, disappearing into its own firmament and leaving nothing of substance. Both sides proffer reach in to grasp at driftwood, only to discover they’re only plucking tiny twigs of comfort from the churning water. Neither is genuinely prepared to really level with the electorate. The truth is the challenges the next government is about to face are beyond imagining. Ageing, climate change and a dearth of resources are all factors that are poised to inescapably alter the comfortable economic assumptions of the past. We can only hope that the politicians who spoke on Sunday night don’t really believe the rubbish they were spouting to the electorate. They’re like parents reading bedtime fairy-tales to the children. If either of them does have a real program for the future, they’re certainly not about to divulge it to us. Nasty facts might get in the way of a comfortable election victory. Neither leader wants to over-share. Another bible story, anyone? So Nic are you the 'suppository of all knowledge' as Tony Abbott so eloquently stated !? Nicholas....... what's this new found religious fervour ? As one old lady stated to me last Friday in the marginal seat of Greenway - "I don't want to vote for either of them... Tony Rabbit or Kevin Grubb'. Indeed. I'm certainly not the suppository of 'all' knowledge, but I don't always talk out of my arse . . . The Labor die-hards won't like my take on this election, neither will the Greens, but there's no point living in fantasy land. I think the signs are already there, they were there on day one. The government will change. And that's why Charles, when we switch leaders we vote for change on the day. I don't dispute your claim, and I can't match it with my own evidence, but I don't think your old lady will vote informal. When she gets into the booth she may dislike both leaders, but will end up plumping for the rabbit, even if that's simply because she's alienated and wants a change.